Welcome to the Harrow Way Community School web-site, and thank you for showing interest in our school. We are very proud of Harrow Way and we hope that we have conveyed something of its qualities on this web-site. We hope that we have provided the information you require but if there is anything else you need to know please feel free to telephone the school or e-mail us. All our contact details can be found here. To view our Prospectus please click here. The Harrow Way School Profile (external link) is available here. School Performance Tables as published by the Secretary of State can be seen here. You can find our contact details, e-mail the school office & individual staff members here. We are a Mathematics and Computing Specialist School as well as being recognised by the National Arts Council with their prestigious Artsmark Gold Award. Harrow Way Community School is a ‘good school’ (OFSTED 2013). In addition we are an Investors in People accredited school and we have been awarded with Healthy Schools and the Level 2 Rights Respecting School status. We are proud to be at the forefront of curriculum development and whole school innovation. There is an excellent Auditorium, which is used for assemblies, as well as to present music, dance and drama events. Teaching rooms are accommodated in curriculum suites to provide cohesive units of academic study; allowing for a flexible approach to learning experiences within departments as well as promoting a good departmental team ethos. The playing fields include pitches for rugby and soccer; courts for netball and tennis; facilities for athletics and summer sports; an artificial cricket wicket. There is an excellent refurbished Sports Hall to accommodate other sports throughout the year, as well as providing an excellent resource for local community use. 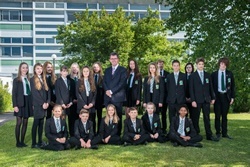 The school employs well-qualified, dedicated, specialist staff, all of whom have the ability to ensure that every student has the opportunity to succeed and reach their full potential, as well as providing all students with a wide range of academic, practical, sporting, cultural and recreational activities. Harrow Way has a good academic tradition. Many of our former students have passed successfully through university into professional roles. Many others have entered further and higher education in a wide variety of fields; supporting our belief that education should be life-long. All our students pursue an exciting and innovative curriculum that will prepare them for life. Our aim is to ensure that all our students are supported and challenged to enable them to take advantage of the opportunities that may present themselves in our rapidly changing society. The school is a thriving establishment serving the needs of the wider community as well as the school population. There is a high quality, successful pre-school facility as well as a comprehensive range of activities and resources for local community use in the evenings, at weekends and during school holiday time. We are continually looking for ways to expand and develop our role in the community. We believe in equality of opportunity and want you to be able to participate fully whenever you visit the school. Please let us know beforehand of any special arrangements that may need to be in place for this to be the case. We have two designated parking bays for disabled people; one at the main reception and one at the Flexible Learning Centre.